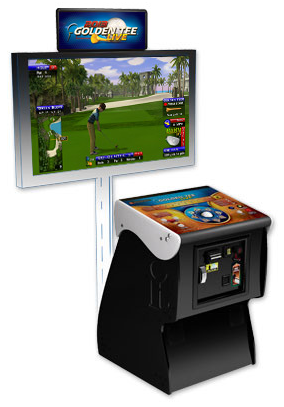 Golden Tee LIVE is designed for commercial use, and uses groundbreaking wireless data transmission technology that allows players to compete in worldwide contests, track their play stats, and a host of other online game features. Pitting video golfers across the world in head-to-head contests for prizes or glory, Golden Tee LIVE takes excitement to new heights by combining it with real-time competition. From the comfort of their local taverns and restaurants, tens of thousands of players can play live and compete simultaneously while scores are updated universally, hole-by-hole. Golden Tee LIVE 2013 introduces five brand new 18-hole courses that incorporate the most favored aspects that players love. These new courses bring the total number of selectable courses to an impressive 40. Graphics and game performance have been enhanced across the board, making Golden Tee LIVE 2013 more powerful than any home system.